Today has been my day off (weird seeing as I was only just off on Sunday but we are gearing up to a very busy week ahead!) and I have spent it well! Off I took myself down to Lewes on a pilgrimage to Middle Farm Farmshop for some yummy delights. And back I came with the boot full to the brim! I also caught up with a colleague for coffee before I jumped in the car and headed home (via the gym). A great day off. Before I left I had a very early lunch of soup. Actually this is no ordinary soup this is the French family broth! This broth keeps my Dad going all through the winter- when there is not a pot of it on the top of the cooker there are always emergency rations in the freezer. 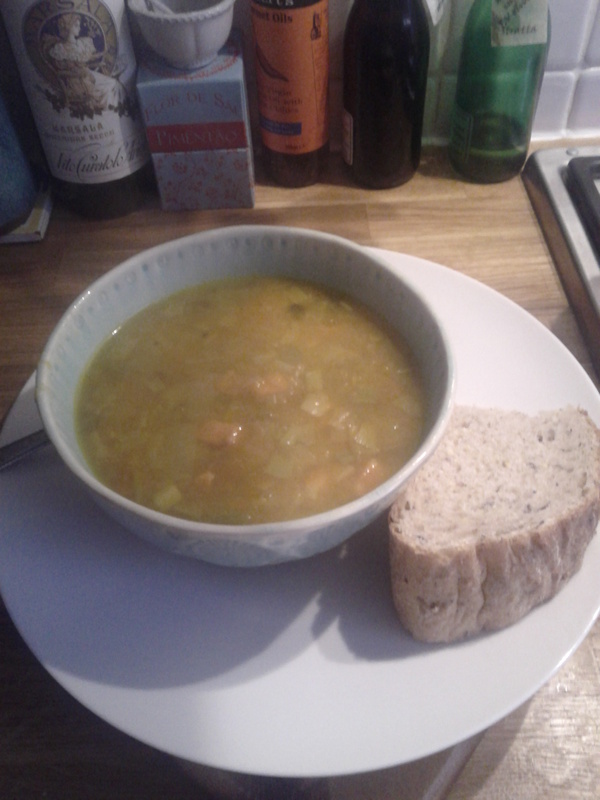 This soup is full of goodness: leeks, potatoes, carrots, swede and sweet potato, topped off with vegetable stock. I have enough for the next couple of days lunches at work so I will be warmed through in the coldey days. For dinner tonight we have had some lamb chops from the farm shop with some carrots, parsnips, sugar snaps and little new potatoes. Very nice.